Here we are going to discuss the reasons and its distinct solution for the above error. When a user upgrades to MS Office 2007, MS Outlook creates an error like Outlook.ost is not a personal folders file outlook 2007. If Office 2007 is not upgraded properly or up gradation is not performed properly then Outlook 2007 has some faults with OST file. Sometimes anti-virus and firewall tools scan your whole system fro virus or malware and may interrupt the operations of OST file. Due to virus attack OST file get corrupted and this is also a major cause for the Outlook.ost is not a personal folders file error. 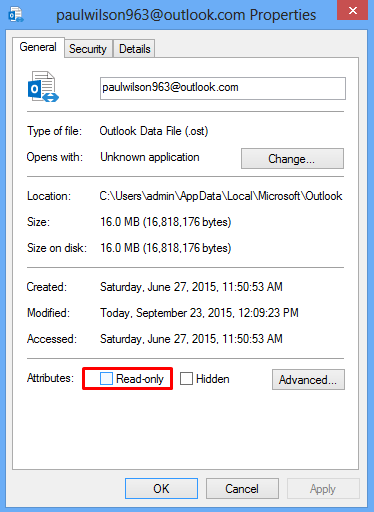 Pathless OST files by MS Outlook. It also occurs if OST file is checked as Read Only. If MS Exchange server accidentally gets damaged or account has been deleted. This Error can be resolve, try to implement these following solutions. Be sure that OST file is not checked as Read Only. Right click on the OST file and select properties to view this. If you recognize that the OST file got damaged or corrupted, Microsoft recommends running inbuilt utility to Repair Inbox (scanpst.exe) that can be capable of repairing the OST and PST files both. Sometimes this scanpst.exe deletes those files which have bad headers. So this utility can only handle for minor corrupted issues. Scanost.ext only works on Outlook 2007 and below versions. so if a user wants to recover corrupted .ost file he/she can choose out Outlook OST Recovery Tool. This software easily recovers damaged offline .ost files from any version of OUtlook like 2016, 2013, 2010 and all below versions.